Yes. We found 8 balloons. But no, we were only listed as having 7 correct balloons in the final standings. Why is that, you may ask? Data entry error! Oh horror! Today I had a nice chat with Jay, one of the DARPA representatives who asked me questions about our team's strategy. 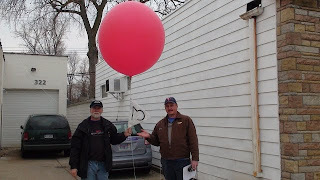 He also managed balloon #8 in Katy, Texas and met the first finders who were local geocachers. Apparently the second place group was missing #8, so it may have been the linchpin location for the challenge. When I asked him about the results he indicated we were in the top 10, but with only 7 correct balloon finds. When I asked what balloon was incorrect other than #5 and #6, he responded with the #7 balloon in Delaware. Really? Not only did we have that early, we had a second group of geocachers verify the location. After checking our numbers I realized that our coordinates were off slightly due to a typo. Instead of 36, we had 35, which made the coordinates off by 1.15 miles. If it had been within 1 mile we would have been safe, but we had the exact coordinates. It goes to show that you should always double, triple and quadruple check your answers. In the end the wrong coordinates didn't cost us the challenge, but it certainly put egg on our faces. To end on a fun note, one of the benefits of having such a strong community is that we could verify if some balloons were fake. This was the best fake of the day.